Sacroiliac (SI) joint dysfunction, once the most commonly diagnosed cause of lower back pain, fell out of the medical mind in the 1930’s when herniated discs became the main scapegoats for back pain. Recently the diagnosis of SI joint dysfunction began to reemerge on the medical scene. Some estimate that it is to blame for 15% of lower back pain instances, but is often confused with sciatica or disc damage. The SI joint is located on each side of the body where the sacrum at the bottom of the spine connects with the ilia, or the large bones of the pelvis. This joint is less than one inch long and has a very small range of motion. It is responsible for transferring the forces of the upper body to the lower body. If an SI joint is misaligned, or if it moves too much or too little, then SI joint dysfunction is present. The condition entails pain at the site of the affected joint that can radiate through the lower back, buttocks, hip and sometimes into the leg, particularly the back of the thigh. There are a number of ways in which SI joint dysfunction can manifest. — A genetic cause is leg length discrepancy. This will cause the pelvis, and therefore the join ts, to be misaligned. — Another cause of SI joint dysfunction is muscle imbalance. The pelvis is the site of many muscles that work closely together to control the movements of the lower body and to support the weight of the upper body. If a muscle imbalance exists, the web of tough ligaments that supports the joint will be tugged in one direction, pulling the joint out of its proper position either upward, downward, to the front or to the back. An example of muscle imbalance causing SI joint dysfunction is that of tight lower back and hip flexor muscles combined with weak hamstrings and abdominal muscles. Hip flexors (muscles in the hip that work to pull the knee upward) and lower back muscles often become tight due to poor posture and improper bending and lifting technique, two biomechanical problems that also lead to underused, weak abdominal and hamstring muscles. The pulling action of the tight, shortened muscles on the pelvis causes it to tilt forward. The ligaments of the joint are strained by this, and the joint may become dislodged. — Another cause of SI joint dysfunction is trauma. A hard fall or other blow to the pelvis can wrench the SI joint out of place. This can create hypermobility or hypomobility of the joint, and both abnormalities provoke the body’s inflammatory response to block off the area. Significant pain results. — Other causes of the condition include infection, pregnancy hormones and osteoarthritis. The only medically certain diagnostic test for this condition involves injecting a numbing agent into the joint and seeing if this alleviates pain. There are other, less certain tests that are still deemed valid for diagnosing the condition. One indicator may be obvious to you without the help of a medical professional: if one side of your pelvis is higher or more forward than the other side. To understand how back pain is produce in the body we need to mention that the spine, or vertebral column, is composed of vertebral bodies separated by intervertebral disks. There are 7 cervical vertebrae(C1-7), 12 Thoracic vertebrae(T1-12), 5 lumbar vertebrae (L1-5), 5 fused sacral vertebrae (S1-S5) and 4 fused coccygeal vertebrae. The four regions of the spine differ significantly in their flexibility. Every pair of vertebrae of the spinal column is separated by a disc and there are more than 30 disks in the entire vertebral column. The Disk is composed of the annulus pulposus, the annulus fibrosus and the end plates. The disk is a hydraulic system that keep the vertebra apart. It acts to cushion any balance or pressure and permits the functional unit to move in flexion to the front, extension to the back, and to the side. The intervertebral discs form approximately 25 percent of the length of the vertebral column. However, this percentage varies in the different parts of the spinal column. In the cervical region the discs contribute 22 percent of the length of the column, in the thoracic region 20 percent, and in the lumbar are 33 percent. The annulus fibrosus of the intervertebral disc is composed of 90 sheets of laminated collagen fibers that are oriented vertically in the peripheral layers and more obliquely in the central layers. The cellular elements of the disc cannot receive blood nutrients thorough the mediation of the synovial fluid but must rely on a diffusional system that provides a metabolic exchange with the vessels that lie withing the vertebral bodies. The nutrition of the intervertebral disc, at birth is performed by some blood vessels that penetrate the disc from the vertebral bone and lateral margins of the annulus, however in the adult stage the disc is totally avascular. The lumbar disc are in fact the largest avascular tissues in the body. The cells of the discs must therefore derive their nutrients and dispose of their waste metabolic products by diffusion from and to blood vessels at the disc margins. Many of the tissued in the spine contain elastic and collagen fibers with mechanical properties. The collagen fibres in the annulus are arranged in a definitive geometric pattern, while the nucleus contains a few randomly dispersed collagen fibrils. The primary function of the intervertebral disc is to allow the spine to twist and bend to an almost continuously variable range of postures. As a resulted of their positions in the spine, the discs are subjected to compressive forces. It’s the nucleus, the most highly hydrated part of the disc, which contributes the majority of the internal pressure needed to balance the applied pressure. The neck is the most flexible part and its discs are relatively thick, and it can be moved easily in all directions. In the chest region the discs are thinner. The lumbar region is relatively flexible because the discs in this area are thick and it has no rib cage to stiffen it. The sacral region is the least flexible part of the spine. The intervertebral disk is a hydraulic system composed of a fibroelastic envelope containing a colloidal gel in its center. The fluid contained withing the confines of the encircling annulus is a colloidal gel and by its self-contained fluidity has all the characteristics of a hydraulic system. If increased intradiscal pressure forces fluid out of the disc, when pressure is released or decreased fluid returns into the disc by imbibition. The disc is constructed like an automobile tire, and like a tire has a high internal pressure of its own. While a tire’s pressure comes from compressed air, the disc’s pressure is due to water. Discs are over 80 percent water. The discs’s high water content makes it highly elastic, that is, able to change its shape and then return to its original form. The disc is, in fact, one of the body’s chief shock absorbers. Compression of the disk takes place in the annulus, if a vertebral disc unit is subjected to massive compression the fluid is rapidly squeezed out of the nucleus. The intervertebral disk has the ability to absorbe large amounts of water, and the essential compound involved in this process is a protein /Polysaccharide gel that can bind almost 90 times its own volume of water. The water is attracted to the ground substance because it contains glycosaminoglycons to high osmotic pressure to allows tissue to withstand compressive load. Osmosis leads to a high internal fluid pressure which can support a load just as the pressure of air in attire supports the weight of a car. With only a limited blood supply, especially to the inner aspects of the disc, the continual changeover of fluid in the nucleus, that it’s ability to be hydrated and dehydrated in a cyclical manner. The nucleus can balance the average compression forces when comparatively fully hydrated. When the nuclear tissue of the disc is damage this hydraulic action is lost. Normally the body weight and other compression forces are transmitted through the nucleus, the hydraulic action of which distributes pressure equally over the surface of the vertebra and the annulus fibrosus. With nuclear destruction pressure is no longer evenly distributed and the major consequence of disc degeneration is the loss of hydrostatic properties, and the gradual decrease in the osmotic swelling pressure of the intervertebral disc. The ability of the disc to imbibe water and distributed load deteriorates with aging, largely owing to changes in the molecular proteoglycans and collagen. When the nuclear tissue of the disc is damage this hydraulic action is lost. Normally the body weight and other compression forces are transmitted through the nucleus, the hydraulic action of which distributes pressure equally over the surface of the vertebra and the annulus fibrosus. In back problems if the disc presses upon any several roots of the sciatic nerve, the person affected will feel the disctintive pain of sciatica and also may have numbness or muscular weakness in the affected leg. If the disc press instead on nerve roots in the neck, then person may feel pain shooting down an arm and have numbenesss and muscle weakness in the hand and fingers. Or if the disc presses nerves in the cauda equine, the continuation of the spinal cord supplying the bladder and bowels, the person may have trouble urinating or defecating. One common sign of back trouble is the excruciating pain called sciatica because it follows the course of the sciatic nerve, the largest nerve in the body. The sciatic nerves are formed in the hip region, one on each side, by the combination of several nerves that emerge from the lower part of the spine. There are 31 pairs of spinal nerves that arise from the spinal cord at each level and exit through the intervertebral foramina. There are 8 cervical, 12 thoracic, 5 lumbar, 5 sacral, and 1 coccygeal nerve. We have 31 pairs of these nerve roots, 62 altogether, emerging from the spine. Each pair of nerves roots services a specific part of the body. The pair of nerves emerging from between the fourth and fifth neck vertebrae, for instance, activates muscles that help, over the shoulders. The nerves coming out from between the sixth and seventh neck vertebrae run to muscles serving the wrist and fingers. In the lower spine, nerves that exit from between the fourth and fifth lumbar vertebrae go to muscles moving the hips and knees, while those emerging from between the fifth lumbar vertebrae and the sacrum activate our feet. Mechanic damage of the spine is generally believe to be a major cause of low back pain. The spine is a highly sophisticated mechanical system of which the tissues are presumably well suited to withstand the forces to which they are normally subjected. Nevertheless, if the tissues are abused, they will be damaged and act as sources of pain either directly through their own nerve supply, or indirectly, because they become distorted and compress nerve roots. Disc lesions are probably best classified according to location, namely cervical, thoracic or lumbar, according to type, namely, bulging, protruded or herniated (ruptured); according to consistency, namely, soft or calcified, and according to position, namely midline or lateral. Bulging disks represent a very early manifestation of displacement, associated with minimal thinning of the annulus fibrosus in that particular area. They are always of soft consistency. It is at this stage that disks are probable amenable to conservative therapy. A certain degree of scarring occurs, and with bed rest, aproppiate exercises and a general improvement in overall health and posture, the weakness in the annulus fibrosus and, possibly, in the posterior longitudinal ligament often seem to disappear. In protruded disks, there is marked thinning of the annulus fibrosus, and probable few such lesions heal spontaneously, in spite of any form of conservative therapy. They maybe soft or calcified. These disks represent further progression of bulging disks and consist of lesions in which there remains merely a thin layer of annulus fibrosus overlying the protruding nucleus pulposus. Protruded disks are the most common form of disk disease. In Intervertebral disk lesions the direction of the protrusion will determine the symptoms. The osteophytos developed and protrude in four general directions: posterior, posterolateral, lateral and anterior. Symptoms may result, depending on the anatomic structures adjacent to the vertebrae whose function is impared from compression. The ligaments that surround the disk are taut when the disk is normal, these ligaments become loose and redundant when the disk collapses. Progresive enlargement of the osteophytes may continue until they encroach on vital soft tissues adjacent to the spine, causing symptoms. In the Cervical region the most common sites of occurrence of such lesions are between C5 and C6 and between C6 and C7, with the later being the more frequent on the two sites. In the Lumbar region the most common sites are L4 to L5 and L5 to S1 interspaces, the latter being the more frequent. Approximately 90 % of disk herniation will occur toward the bottom of the spine at L4-L5 (Lumbar segments 4 and 5) or L5-S1 (lumbar segment 5 and sacral segment 1). Disk problems in the cervical spine will not only cause neck pain, but may experience headaches, shoulder, arm and hand pain, numbeness or weakness, chest pain, Thyroid problems, as well as ringing in the ears and blurred vision. In the thoracic area can lead to middle back pain, pain radiating around the rib cage, chest pain, heart palpitations, difficult breathing, and headaches. And finally in the lumbar region can lead to low back pain, pain traveling down the leg, pain in the feet, bowel and bladder problems, as well as sexual organ dysfunction. In disc problems the disc don’t receive very good blood flow. Blood is responsible for carrying oxygen and nutrients to injured tissues for faster healing, and because the discs don’t receive this blood supply, then tend to be very problematic when it comes to healing. Herniated disks, or the so-called rupture form, are seen in cases in which there is an actual tear in the annulus fibrosus and posterior longitudinal ligament, with escape of part of the nucleus pulposus through the tear. A small fragment of the nucleus pulposus may escape or there may be completed herniation, with the degenerated disk lying free. Calcification of the end plates cartilage and vascular changes seen in older vertebrae probable impede the delivery of disc nutrients from the blood. Disc nutrition is made by diffusion, diffusion of solutes occurs through the central portion of the end plates and through the annulus. Glucose and oxygen enter via the end plates. The nucleus pulposus may act as a chemical or a inmmunogenetic irritant to the nerve roots. The nerve roots showed different degrees of inflammatory response, which is a physical impediment to the diffusion of nutrients from the cerebrospinal fluid through the membranes of the nerve root. This produces conditions that prevent or delay the delivery of essential nutrients normally supplied by the microavasculature. Its not the mechanical pressure alone that causes the phenomena of nerve root pain but rather an abnormal chemical environment of nerve root that alters electrical activity. The nerve root can be involved in nerve root compression or nerve root irritation. The supporting structures that give the spine stability include the anterior longitudinal ligament, the posterior longitudinal ligament, the intervertebral disks, and the musculature of the neck and trunk. Every day, we do certain activities that contribute back discomfort. Some of these activities include lifting of heavy objects or even the slightest activity like sitting; can cause our back to experience discomfort. It hurts because of the force applied in our muscles located at our back. There are alternative ways in avoiding back pain and discomfort. Listed below are the three ways to prevent back straining in each activity. 1. Lifting – Almost every day, we lift different kinds of things from the ground. Whether it’s a pencil or a small object that is fallen on the ground, we lift the object and use our muscles at the back. When we lift light objects, it doesn’t require too much pressure for our back to experience pain. However, the heavier the object being lift, the more force and pressure is applied to our back. And so, having a correct posture can eliminate the back discomfort from lifting heavy objects. You must first bend your knee and hold the object at each end before lifting. If you are used in bending your back before lifting, then you’re doing it wrong. It can even cause back injury, if your back can’t handle the weight of an object. Hence, proper posture is very important in lifting to avoid back pain. 2. Standing up and Stretching – If your job is to work in the office, sitting for more than 8 hours a day, then you should’ve experience back discomfort. Sitting too much applies tension in our back. The only alternative way for these office workers are to have time to stand up and stretch your back from time to time. You can do the stretching during break hours. This can help your muscles relax. 3. Daily Exercise – Whatever your task is, you must spend some time to do an exercise. It will help to increase your stamina and will cause your muscles to become stronger. It does not only help avoid back discomfort, but has many benefits for the whole body. Examples of exercises that can avoid back discomfort are jogging, jumping jack or use a jumping rope, stretching or even yoga. If you can apply these steps in each situation you are in, then back discomfort can be prevented. Having no pain at the back is really a relief. Now, you can focus more in your work and go home happy without stress of experiencing back pain. A fairly high proportion of us spend up to eight hours a day working in an office environment. Bad posture puts pressure on your lower back, it is especially true when sitting, the spine is compressed which can cause inflammation and ultimately pain. Bad backs occur slowly and over time, unless of course you have suffered a trauma of some kind. To avoid back ache you will need to maintain a good sitting posture. Orthopaedic surgeons will tell you not to just collapse into a chair when sitting down, slumping in a chair is definately one to avoid. Your chair should support your back well. This should allow the muscles, ligaments and tendons in your back to relax, and align the spine. If you do not have any activities because your job involves sitting down all day, then you will need to exercise to keep your back in optimum condition, consult with your Orthopaedic surgeon who may refer you to a physiotherapist. · Sit and stand in such a way that your bones are evenly balanced Since pain in the back is often caused by inflammation, the Arthritis Foundation recommends that you “chill the joint when you have a sudden flare-up”. Most offices have a fridge/freezer these days, apply a cold pack for 20 minutes, but make sure you protect the surface of your skin first. It is estimated that forty per cent of UK adults had back pain in the previous year, with 15 per cent in continuous pain; the survey was carried out by the Department of Health 2010. 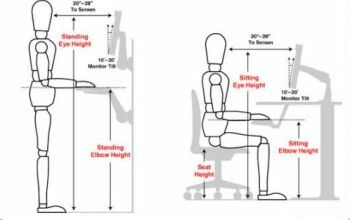 To help you eliminate discomfort keep thinking about your posture, how you sit, the kind of chair you sit in, how your work space is arranged. Take time to stretch throughout the working day, this can also be done from a sitting position. Take care of your back, it is the only one you have. Sciatica applies to a group of symptoms that are generally caused by an ache in the lower back called a radiculopathy which occurs when a nerve root that is adjacent to the sciatic nerve is irritated or pressed together. A few different low back disorders can lead to sciatica. There are six major sciatica causes that you may come across such as lumbar herniated disc. A lumbar herniated disc takes place when the nucleus breaks through the fibrous outer core of the herniated disc and annoys the contiguous nerve root as it goes out of the spine. Normally, people would think that a sudden twisting motion can lead to disc herniation or sciatica but most discs weaken in due time because of the repetitive stress. Herniated disc is also known as slipped disc, bulging disk, or pinched nerve, and sciatica is the most common symptom of lumbar herniated disc. Most sciatica causes are easily eradicated. One other common cause of sciatica is lumbar spinal stenosis. Spinal stenosis is a nerve compression disorder which habitually affects mature people over the age of 60. Pain in the leg area similar to sciatica may happen as a result of lumbar spinal stenosis. Lumbar spinal stenosis is associated with natural ageing in the spine which more often than not results from a mixture of one or more of the following medical conditions – overgrowth of soft issue, enlarged facet joints and bulging disc which annoys the nerve roots as they flow out of the spine causing sciatic nerve pain. Spondylolisthesis is one of the sciatica causes that most often happen in the lumbar spine. It is distinguished by one vertebra slipping forward over adjoining vertebra. When the vertebra slips and is dislocated, spinal nerve root compactness happens and often causes the sciatic nerve leg pain. Spondylolisthesis is classified as a case that is found at birth and develops during childhood, trauma or physical stress. Despite the fact that disc degeneration is a normal procedure that happens throughout ageing, for some people one or more degenerated discs in the lower back can annoy a nerve root and produce sciatica. Such a disc is identified when a weakened disc effects in excessive micro-motion at the spinal level and the inflammation from inside the disc become bare and annoys the nerve roots. Many sciatica causes are through past motor vehicle accidents, rugby or any other sports, a fall down the stairs can trigger sciatica pain as direct nerve compression causes exterior forces to the sacral spinal nerve roots. The impact from the accident or sports injury may injure the nerves or fragments of broken bone may apply pressure to the nerves. Other sciatica causes such as piriformis syndrome can cause the sciatic nerve to be irritated as it is situated under the piriformis muscle. If the muscle pinches or annoys a nerve root that consists of the sciatic nerve, it can lead to a pain akin to sciatica causes. However, this may not be a true sciatica symptom but the pain felt in the leg is the same as caused by the nerve irritation. Spinal tumours may also be one of the sciatica causes which are less common. Even though spinal tumours are rare, when the tumour develops in the lumbar region, there is a threat of sciatica occurring as a result of nerve compression. If you feel that you have one or two of these sciatica symptoms then it is best to make a doctor’s appointment to get the underlying problem checked. Back pain has many possible causes, ranging from chronic muscle tension to disc problems to tumor or infection. Although some conditions are serious, requiring prompt medical treatment, a lot back pain results from stress, tension, and strain that can be helped by massage therapy. To understand some of the conditions that can lead to back pain, take a look at the anatomy of the spine. Bones called vertebrae make up the bony spinal column. The vertebrae stack on top of each other, separated by jelly-like cushions called intervertebral discs. Adjacent vertebrae are connected by ligaments at the facet joints. Plus, many muscles surround, support, and move the spine. Holes in the vertebrae, called vertebral foramen, create the spinal canal, which houses the spinal cord. The spinal cord is a large bundle of nerves that controls the entire body. Individual nerves leave the spinal cord to travel to other parts of the body through openings in the vertebrae called intervertebral foramen. Arthritis in the facet joints. outward curve in the upper back), or too much or too little curve in the lower back. Bulging or herniated discs that press on a nerve. Although massage is not appropriate in some circumstances, such as tumor, infection, or stress fracture, a lot of back pain is due stress, tension, strain, sprain, and other factors that massage therapy can help. Muscle tension is a part of most back pain. Even with other factors involved, relieving muscle tension and balancing the muscles around the spine can help relieve pain. Massage can also improve blood circulation, which helps the body in self-healing, and increase the level of endorphins, natural pain-relieving chemicals produced by the body. The type of massage that works best for pain depends on the underlying cause and the skill of the massage therapist. If stress and muscle tension are the main problems, basic Swedish massage can help release tension. Adding essential oils for an aromatherapy massage can provide even more relaxing benefits. However, often more specific massage techniques are needed. For example, deep tissue massage targets problems in the deeper muscles around the spine. Another type of deep massage, which uses negative pressure rather than deep pressure, is cupping massage, a technique adapted from Traditional Chinese Medicine. Cupping massage uses cups that create suction and lift muscle tissue rather than compressing it. Some massage therapists use fire-cupping, removing the air from a cup using a flame and then placing the cup on a person’s body. Other therapists use a manual vacuum set, placing a cup on the body and removing the air from with an attached pump. The therapist then moves the cups to perform massage strokes. Another massage technique for back pain is myofascial release. Fascia is connective tissue that covers muscles and most other internal bodily structures. Myofascia refers to the combination of muscle and fascia. Myofascial release applies gentle sustained pressure to restrictions in the myofascia to eliminate pain and restore motion. Sometimes the location of the pain is not the source of the pain. Trigger points are small, irritable spots in the muscles that cause pain in other areas. For example, trigger points in the abdominal muscles can cause low back pain, and trigger points in one part of the back can cause pain in another part of the back. Two common massage approaches to get rid of trigger points are neuromuscular therapy and trigger point therapy. Each therapy has its specific methods, but the basic technique is either to apply direct pressure to the trigger points for as long as 30 to 60 seconds or to use short, deep “stripping” strokes over the trigger points.